Wed., June 27, 2018, 5:55 a.m.
Around the Northwest League and Texas Rangers affiliates for Sunday’s games. 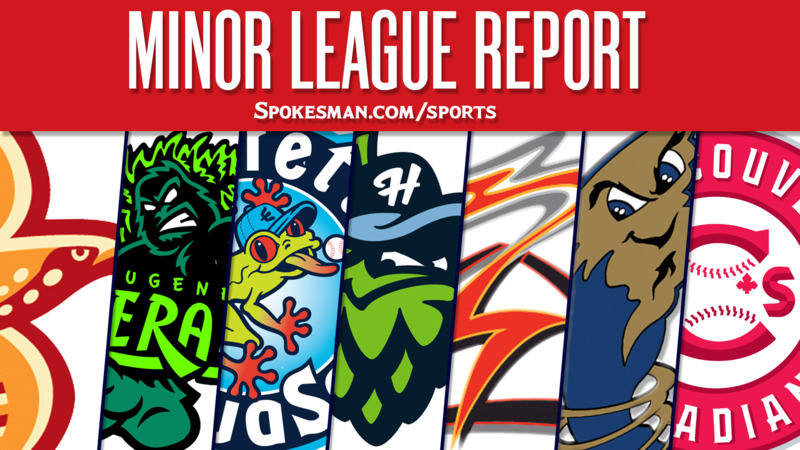 Spokane 7, Everett 5: Curtis Terry hit a two-run home run as part of a four-run eighth-inning rally and the Indians (5-7) came back to beat the visiting AquaSox (7-5). Terry added an RBI single in the first inning. Diosbel Arias went 3 for 3 with three doubles and two runs, while J.P. Martinez homered, singled, stole a base and scored twice. Scott Engler (2-0) pitched four innings of no-hit relief and struck out three. Boise 7, Hillsboro 5: Kennard McDowell homered, Luke Morgan went 3 for 4 with two RBIs and the Hawks (7-5) held off the visiting Hops (6-6). Boise built a 7-0 lead through seven innings and Hillsboro scored two in the eighth and three in the ninth, but Hayden Roberts came in to record the final three outs for a save. Vancouver 7, Tri-City 1: McGregory Contreras hit a two-out grand slam in the third inning and the Canadians (4-8) beat the visiting Dust Devils (6-6). Will McAffer (2-0) got the win with two innings of perfect relief. Salem-Keizer 10, Eugene 5: Trevor Abrams went 3 for 5 with two doubles and three RBIs and the Volcanoes (8-4) handled the Emeralds (5-7). Gregory Santos (2-0) struck out five over six innings. Round Rock 3, Omaha 2: Willie Calhoun hit a two-run double as part of a three-run fourth and the Express (35-42) beat the visiting Storm Chasers (35-41). Michael Roth (4-3) gave up two runs, one earned, on five hits and three walks over 5.2 innings. Frisco: The RoughRiders were off on Tuesday. Potomac 9, Down East 5: Bryan Mejia went 2 for 3 with five RBIs and the visiting Nationals (39-33) handled the Wood Ducks (37-39). Rhett Wiseman added a solo homer for Potomac. Hickory 5, August 4 (11): Pedro Gonzalez singled to score the winning run and the Crawdads (33-41) edged the visiting GreenJackets (39-35) in extra innings. Gonzalez went 2 for 5 with two RBIs. Ryan Dorow went 3 for 4 with an RBI and Yonny Hernandez added three hits. Published: June 27, 2018, 5:55 a.m.